Convert photos into cartoons with just few clicks of a mouse with our FXCartoonizer for windows PC. Now, you can convert all of your pictures and images into cartoon effect more quickly and precisely. You can convert large or high-quality photos into cartoons with best results. Besides, you can also edit your photos and make multiple adjustments even before or after converting them. Add many items, crop your photos, resize and adjust the brightness and contrast. High Quality Cartoon Effect Result! 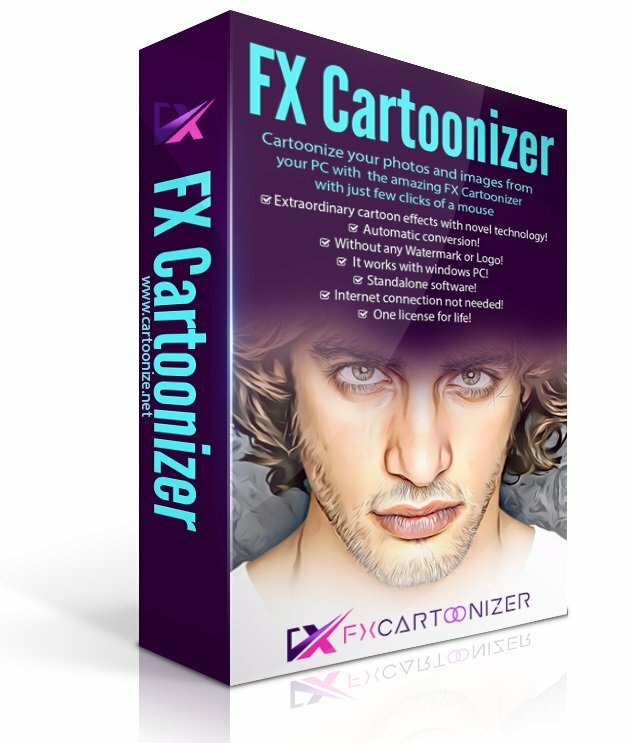 FXCartoonizer allows you to convert images into cartoons and drawings. You can use this software to illustrate your family photos, events or to create cartoon images of your holiday trips. - The good thing is that you can let the people know how you look like without sharing your actual photo but a cartoon of yourself. - You can make cartoons of your friends, pets, house, neighborhood and especially the celebrities and the politicians. - Cartoons will be the best gift for your family and friends. You can also use them on mugs and T-shirts. - Undoubtedly, this software is a great fun and addictive, too. It is very easy to use and also intuitive. - No need of great artistic skills because no manual drawing is involved. - The software uses very novel technology to execute the whole process. - First of all, it splits the image into solid color patterns just similar to a mosaic. After that, it converts the minute details of the image into cartoon format. - Since it applies effects throughout the photo, the end result is always of high-quality. - Cartoon yourelf without any Watermark or Logo! First of all, you are required to navigate the desired photo or image from your computer. You have to click the tab 'Add' in the software to access the photos. After selecting the photo, upload it by double clicking. You can resize the photo or zoom it in. Besides, you can also adjust the brightness, contrast, cyan, magneta and yellow effects.' Crop' feature on the right side allows you to crop the photo. You can also 'undo' the effects or entirely 'reload' the photo. After doing all the desired changes, you just need to click an effect and there you go! You can even make all types of adjustments with the cartoonized photo. Avail multiple effects to make your pictures desirable and mesmerizing. You can conveniently convert your photos into cartoons just within seconds. It is extremely simple software with the main theme of turning images into cartoons. It allows the users to covert photos into cartoons really fast than normal process. With the help of crop function, you can remove any unwanted part/parts of your image. No other standalone program or software is needed; it does all the functions itself. You need not to save the photo to print it. You can do it right from within your software. Resize function available, you can resize your photo before or after the conversion.